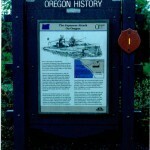 Click the title of each marker to see details about the markers. 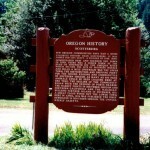 The story began at the Oregon Caves in 1938. 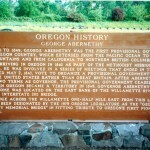 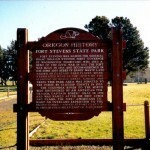 After taking a tour, William B. Gruber, an Oregon inventor, met Harold J. Graves, the president of postcard company, Sawyer’s Inc.
Subject: George Abernethy was the first Provisional Governor of the Oregon Country. 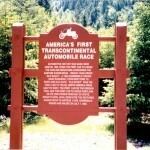 Subject:First car to cross the Cascade Mountains in 1905 traveling from New York to Portland. 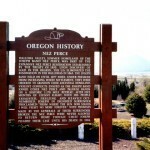 Subject: Before dam construction on the Columbia River, the falls were ancient fishing grounds of all the Indian tribes of the middle Columbia River area. 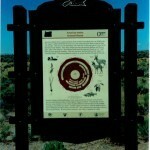 Subject:Describes the ancient beginnings of Brownsville and its evolution of names. 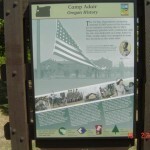 Subject: Durkee was a favorite emigrant campground and later a relay and stage station. 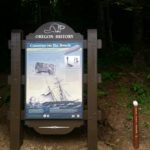 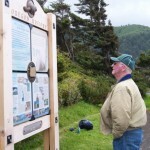 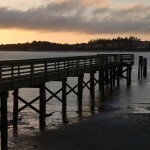 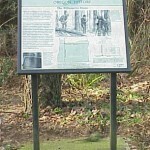 Subject:William Clark’s visit to this area in 1806 and his purchase of whale oil and blubber from the local Indians. 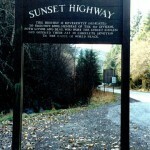 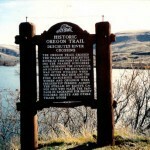 From I-84, take exit 234, then drive south on old Highway 30. 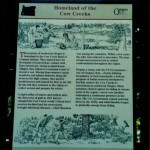 Emigrants waited near the summit of the Blue Mountains for stragglers to catch up, resting from the difficult ascent and watering their livestock while they waited. 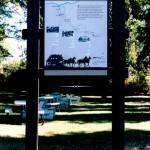 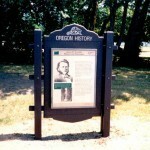 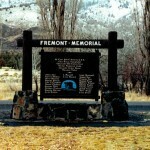 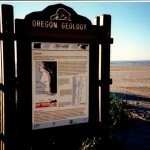 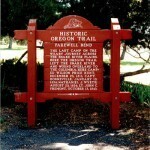 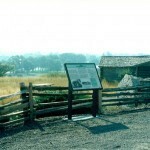 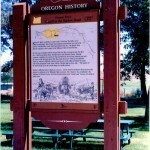 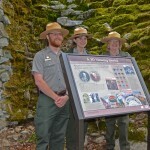 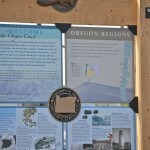 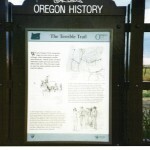 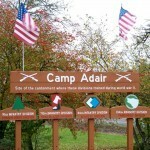 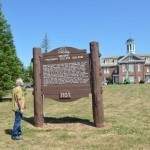 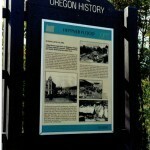 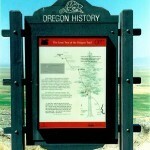 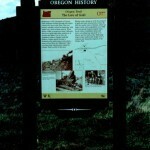 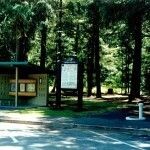 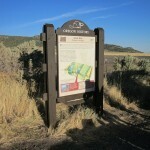 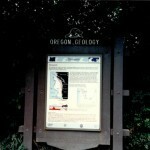 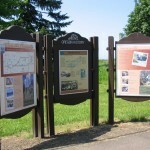 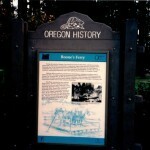 Interpretive displays complement the Oregon Trail monuments at the park entrance. 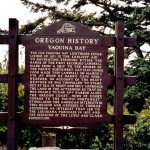 Prior to the attack on Pearl Harbor, a contingent of Japanese I-Class submarines sailed from Yokosuka via the Marshall Islands to take up positions off Hawaii and the coast of North America. 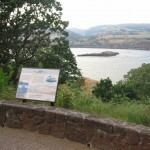 Five of these vessels carried midget two-man submarines and 11 carried aircraft. 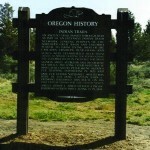 Subject:Tells the story of the tree that served as a landmark for Indians, trappers and Oregon Trail emigrants. 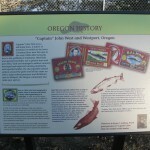 Subject:Dr. John McLoughlin was the Chief Factor of the Hudson’s Bay Company and founder of Oregon City. 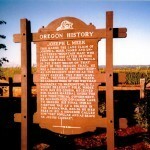 Subject:The land claim of Meek, mountain man, who helped found the Oregon Provisional Government. 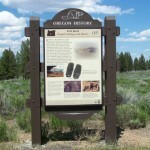 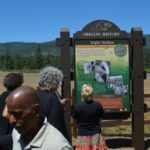 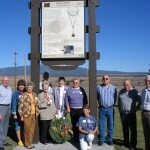 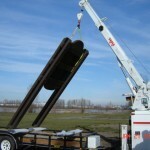 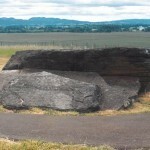 Subject:Site of ancient burial ground for Mid-Columbia Tribes. 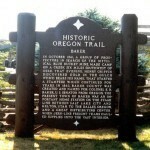 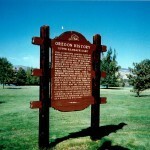 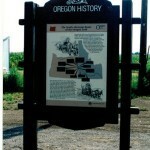 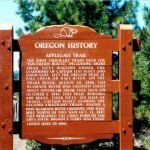 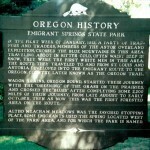 Subject:Travels of Ogden and his fur trapping party through Oregon. 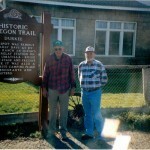 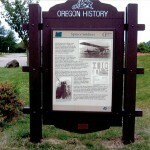 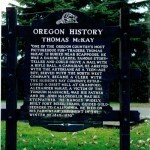 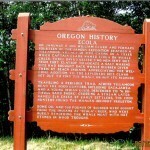 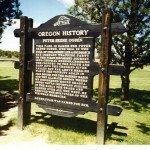 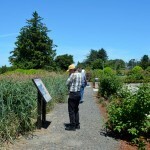 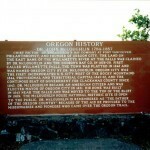 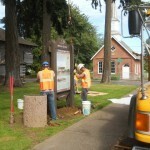 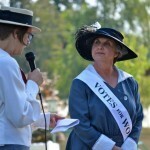 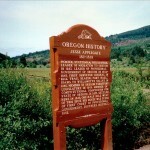 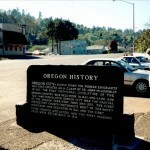 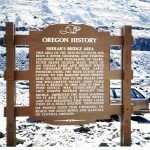 Subject:Honors Dr. McLoughlin, pioneers, early Oregon government and many firsts in Oregon. 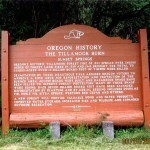 Subject:Notes uses of site ranging from early Indian salmon fishing village to first long-distance hydroelectric power generation in the United States. 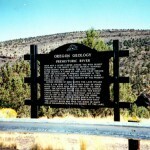 Subject:Gateway to Central Oregon crossing the Deschutes River. 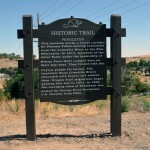 Subject:Describes the pioneer route along the Snake River. 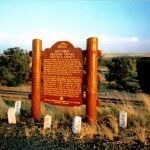 Subject:The discovery of gold sends thousands of fortune hunters into the upper John Day basin. 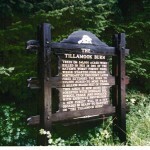 Subject:Describes the devastating forest fires of 1933, 1939 and 1945 and subsequent reforestation. 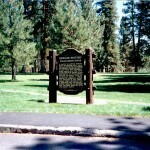 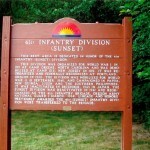 Subject:The site of disastrous forest fires in 1933, 1939 and 1945. 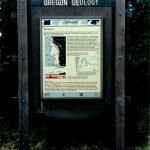 Subject:Klamath Lake wildlife sanctuary and Oregon’s largest body of water. 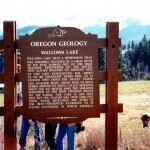 Subject:Wallowa Lake was created by the advance and retreat of alpine glaciers. 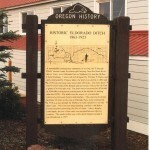 Subject:Founded the first cannery on the Oregon shore of the Columbia River and exported lumber and canned salmon globally. 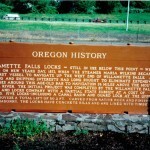 Subject:Series of five locks with a total lift of 50.2 feet opened in 1873. 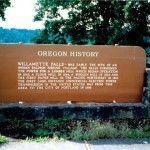 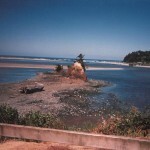 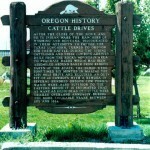 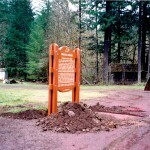 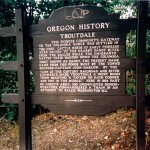 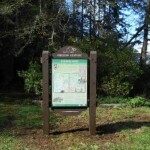 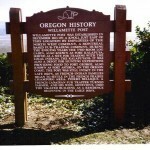 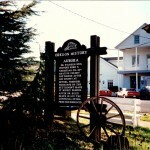 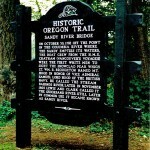 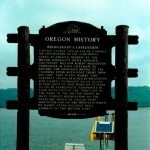 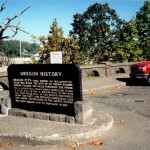 Subject:The first trading post in the Willamette Valley in 1811.